Watch this video as Cisco wakes the world up with the Internet of Everything. Cisco unveils global integrated marketing campaign, "Internet of Everything", is a revolutionary campaign with a big message: Connecting people, process, data and things will make the network more valuable than ever. SAN JOSE, Calif., Dec. 10, 2012 – The Internet is only 8000 days old. 2.5 billion people and 37 billion things will join the Internet by 2020. And Cisco believes this is just the beginning. 99 percent of things in the physical world are still unconnected, ready to be woken up. 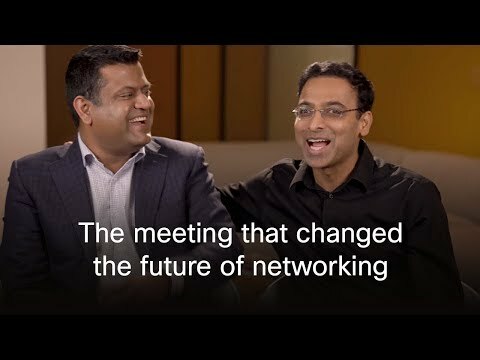 Today, the company launched a new campaign that showcases how Cisco makes amazing things happen when we connect the unconnected. These new connections mean unprecedented opportunities as people, processes, data and things join and interact on the "Internet of Everything." Things like medical devices. Buildings. Even highways. Cisco's campaign, developed with branding and advertising agency Goodby Silverstein & Partners, introduces the tagline "Tomorrow Starts Here." There's broadcast advertising, digital and social media. And a technology that's suitably innovative: augmented reality-enabled print advertising. With a smartphone or tablet, readers can bring print advertising to life. They can open up a world of videos, case studies, whitepapers, and infographics that they can share, like, follow or download. It proves this massive shift isn't just coming. It's happening. "When the Internet emerged just over two decades ago, it changed everything. But what we're about to see makes that pale in comparison," said John Chambers, chairman and chief executive officer, Cisco. "The Internet of Everything will disrupt all kinds of industries. That means new opportunities, new businesses, new experiences and new services. And big opportunities for people, companies, and countries. "The ‘Internet of Everything' demands a distributed, application-centric networking, computing and storage platform that connects things in ways that just weren't possible – even imaginable - before. And that explosion of new connection depends on Internet Protocol (IP)-enabled devices, more broadband access around the world, and IPv6. Our network provides an intelligent, manageable, highly secure infrastructure that can scale to support billions of connected devices." "We love making change happen," said Blair Christie, senior vice president and chief marketing officer, Cisco. "It's in our DNA. Today's leaders want partners who can guide them through change and shape their organizations for the future. They're asking: how can all this connectivity help me grow my business, deliver better services and experiences, and open up new possibilities? Well, we've got the answers. The Internet of Everything will transform the way we live, work, play and learn, and we're right at the center. I think our new brand strategy captures the optimism and the opportunity waiting for Cisco. And the world." Cisco makes amazing things happen when you connected the previously unconnected. Watch this video as Cisco wakes the world up with the Internet of Everything. Join the "Internet of Everything" conversation on Twitter by using the hashtag #TomorrowStartsHere or #IoE and also follow Cisco on Twitter @CiscoSystems. You can like Cisco on Facebook at http://facebook.com/cisco. Download the Cisco App to activate the augmented reality experience on your mobile device. Read the blog from Cisco's Chief Futurist, Dave Evans as he describes how the real value of the Internet of Everything (IoE) lies in both the number and value of connections.